Come to Us Now, Emmanuel (Incorporating the traditional carol "Still, Still, Still"). Composed by Don Besig and Nancy Price. Choir Sacred. For Opt. Flute or C-Instrument (SATB choir). Choral (Sacred); Choral Octavo; Worship Resources. Advent; Christmas; Sacred; Winter. Grade 3. Choral Octavo. 12 pages. 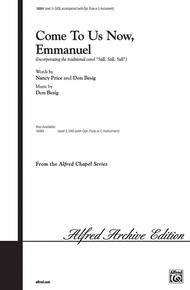 Published by Alfred Music (AP.16064).Come to Us Now, Emmanuel is an anthem for Advent or Christmas Eve. Suggested corresponding lectionary readings include Psalm 80: 1-7, Isaiah 9: 1-7 Luke 2: 1-20 and Titus 2: 11-14. One basic homiletical theme is singing with peace and gladness the happy news: the Savior of ancient prophecy is here. He is Emmanuel, God with us!Inst. Parts Available (choral).